While some Democratic politicians have recently gotten behind a push to abolish Immigration and Customs Enforcement (ICE), a poll released Monday by the Associated Press-NORC Center for Public Affairs Research found that just 25 percent of Democrats are in favor of getting rid of the agency. Despite only a quarter being in favor of abolishing ICE, 57 percent of Democrats view the agency unfavorably and 57 percent of Republicans view it favorably. Nearly half of Independents – 46 percent – have no opinion. 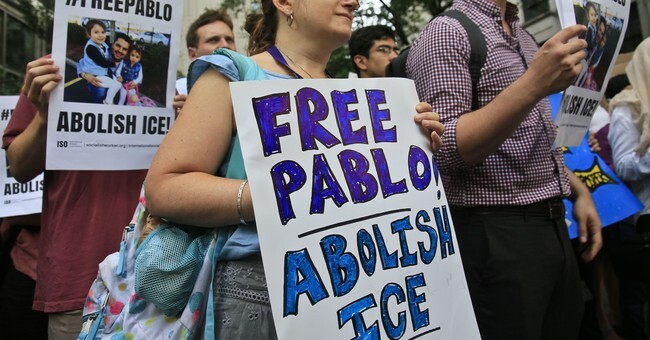 Only 24 percent of Americans overall support abolishing the agency, 40 percent oppose abolishing ICE, and 34 percent have no opinion. AP notes that, following the scandal of family separations at the border, ICE is viewed slightly more negatively overall. Thirty percent of those surveyed had a favorable view of ICE compared to 37 percent with an unfavorable view. Additionally, a third of those surveyed – 33 percent – have no opinion of the agency. On the immigration issue overall, most Americans – 61 percent – disapproved of President Trump’s handling of it, while 38 percent approved. This number has remained the same since February. Sens. Kirsten Gillibrand (D-NY), Kamala Harris (D-NY), and Liz Warren (D-MA) have all recently called for abolishing ICE.